Matlake is a long, pretty village which lines the southern edge of the park of Barningham Hall. No doubt most of the inhabitants worked for the Barningham Estate in years gone by. 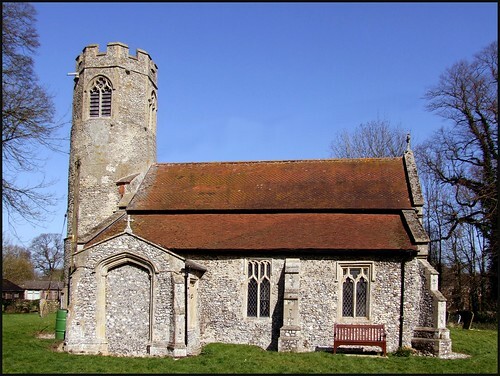 St Peter is an attractive round-towered church at the eastern end of the village. It appears rather quirky, because the chancel is missing. It collapsed in 1726, during the morning service, according to Mortlock. Fortunately, it fell outwards, and nobody was hurt. There is a wide south aisle, and as a result you step through the north doorway into an attractive square space. At the west end of the nave, the shingle and brick eastern side of the tower has been exposed, which is very attractive. Characterful corbel heads look down on a pleasingly rural interior. Matlaske was obviously high in the Anglo-Catholic firmament at some point, and what survives today is devotional and seemly. The 1860s bible is still in use, and the service book on the altar dates from the early years of the 20th century. The altar rails came here from North Barningham when the church there was declared redundant. Hanging in front of the sanctuary is one of those big brass chandeliers familiar from several churches around here, but in such a small space as this it makes a dramatic statement, evocative of those exciting days of early 20th Century Anglican triumphalism, now out of sight.